Juan Pro is a professor in Contemporary History at the Universidad Autónoma de Madrid, Spain, and Coordinator of the Interuniversity Programme for the Doctorate in Modern and Contemporary History. He is currently director of HISTOPIA [History of the future: Utopia and its alternatives in the modern horizons of expectation, 19th–21st centuries] and coordinator of the Transatlantic Network of Utopian Studies. Each of the thirteen authors who participate to this collective volume address a particular case or specific aspect of Latin American utopianism from colonial times to the present day. The relationship between utopia and America – Latin America in particular – has been a constant throughout the ages and helps to clarify both the concept of Utopia and of Latin America. The one cannot be understood without the other, from the book of Thomas More in 1516 to the present. Myths and legends of utopian content already proliferated at the time of the voyages of exploration, spurring on the conquistadors, while the knowledge gap about lands awaiting discovery was filled with stories about utopias. The America that the Spanish and Portuguese discovered became, from the sixteenth century onwards, a space in which it was possible to imagine the widest variety of forms of human coexistence. Utopias in Latin America reconsiders the sense and understanding of utopias in various historical frames: the discovery of indigenous cultures and their natural environments; the foundation of new towns and cities in a vast colonial territory considered as empty space in which it was possible to start afresh; the experimental communities of nineteenth-century utopian socialists and European exiled intellectuals; and the innovative formulae that attempts to get beyond twentieth-century capitalism. This volume contains 13 the essays on Latin America as a setting for utopian thought and action, focusing on specific cases and aspects. 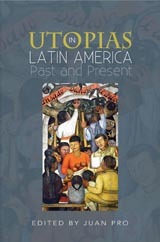 Historians and other scholars from Latin America, Europe, and the US examine the different ways the term "utopia" has been used in Spanish; five of the utopian colonies established in Paraguay in the 19th and 20th centuries; the utopian project that Vasco de Quiroga developed in New Spain from 1532 on; The City of the Sun by Tommaso Campanella as a utopia critical of Iberian empires; utopian imagination in Chile in the 1820s; Bartolomé Victory y Suárez and Etienne Cabet's writings on utopian socialism; the French, British, and Spanish intervention against the government of Juárez in Mexico and the subsequent Mexican Empire under Maximilian I in terms of utopian concepts and proposals; Plotino Rhodakanaty's version of utopia in Mexico; Giovanni Rossi's Cecilian Colony experiment in Brazil; spiritualism and social imagination in 19th-century Mexico; José Vasconcelos' prophecy of a utopia in La raza cosmica; the Venezuelan commune as a utopian prefiguration; and recent utopian experiences in Argentina. Altogether, this volume charts a journey well worth taking. It sheds light on areas of knowledge and experience often sidestepped by more traditional disciplinary approaches and literary scholarship. It also demonstrates the ex­ traordinary potential of utopian studies as a way to expand boundaries, explore alternative realities, and create interdisciplinary dialogues.